Kids love to be outdoors so here’s an alert to some great deals on outdoor furniture! It’s hard to keep my kids inside with a great backyard like ours but I do worry about sun exposure even though they wear sunscreen and a hat. Kidkraft have sun concerns covered with its great range of outdoor play furniture and right now it’s 20 per cent off! 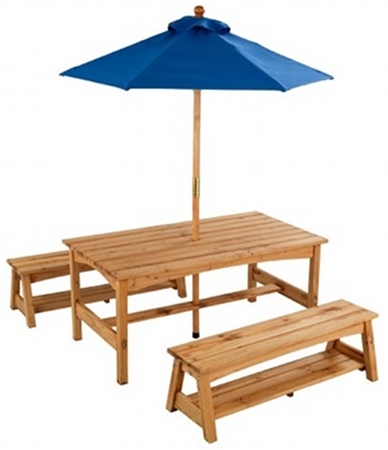 The Outdoor Table and Benches (above right and below) has dropped to $319 from $399 – a saving of $80. Trust me when I say these will be used for years and years so they’re a great investment. It comes with a blue umbrella for weather protection and is made from Sanmu wood. There is underbench storage and the set can accommodate multiple children. Also available is the Backyard Sandpit with striped sunshade (top left). We love the retro stripes on this one, with the cover keeping your kids protected. It has reinforced side panels to prevent warping, a mesh cover and is perfect for kids from ages two to eight. 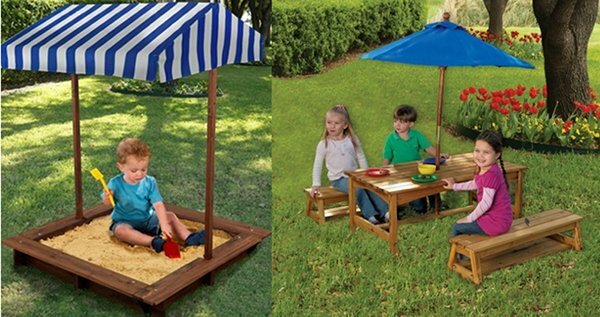 The sandpit is just $199 down from $249 which is a discount of $50! Got a large brood? 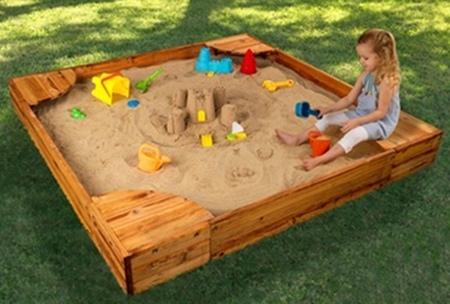 Then the 1.5 metre square Large Backyard Sandpit (below) is for you. This one also has a mesh cover to prevent those neighbourhood animals and debris from the garden from sullying the sand. It will happily hold many children all at once for hours of play. This one is down from $399 to $319, a saving of $80. This offer won’t last long so hurry and get the outdoor gear you’ve been wanting from Buyster!